An eerie, quiet and unsettling ghost story determined to get under your skin! I was keen to watch The Woman in Black for two reasons: one, to see how Daniel Radcliffe’s career begins after a decade of Harry Potter, and two, it is made by Hammer Studios, the studio that brought us Christopher Lee as Dracula in the 1950s and a landslide of the “classic movie monster” films. Only recently had they remade the Swedish Let the Right One In. The result? As a 12A rated horror movie, both have done an exceptionally clever thing by combining; making it the highest grossing Hammer film in the USA, no doubt giving the studio a new lease of life. Radcliffe too proves he is very capable outside of the coy, wide-eyed children’s genre. His career should be promising. Radcliffe plays the part of Arthur Kipps, a young lawyer and single father who is sent to settle the deed on an abandoned house since the owner’s death. 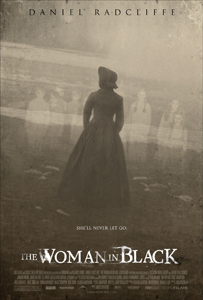 Spurred on by the threat of losing his job, Kipps is initially undeterred by the locals’ fearful superstition, but once his presence in the house awakens a curse upon the town and its children… Kipps must uncover the mystery of the ghostly Woman in Black. The film is virtually silent whenever it sneaks cautiously through the old Victorian house, the scares varying between jump scares and subtle, fast glimpses; the camera lingers with great gaping dark spaces over Radcliffe’s shoulder frequently. The physical presence is extremely limited until the chilly finale, limited to the torture inflicted upon the town’s people. While it could be argued the film should have been a 15 (or a return to a 12 rating) it is still an attention-holding ghost story. Simple with very traditional trappings, but wonderfully chilling, as it should be.